Over the top today? Tomorrow? The Legal Genealogist is a huge fan of the project by Maureen Taylor, The Photo Detective, to bring the faces and the stories of Americans who lived in the Revolutionary War era — and lived on long enough to be photographed — to life in a film called Revolutionary Voices: A Last Muster Film. It’s a huge undertaking — doing the whole thing and doing it right will carry a price tag in the hundreds of thousands of dollars. But the film can be made — it will happen — if the project can raise the seed money for the filming. The fund-raising is through an outfit called Kickstarter where folks involved in the creative arts can ask for and receive support from the general public for projects that otherwise would never see the light of day. Contributions aren’t tax-deductible, they don’t buy an ownership interest in the ultimate product. You do it because you think the project is the right project to be done and the person doing it is the right person to be doing it. I’m all in on this one. I have no doubt that this is a project that needs to be done — just think about a class of kids watching this film! — and that Maureen is the person to do it. Readers here took me up on my challenge to match the first 50 pledges with an extra $5 of my own, on top of my personal contribution. So with the $250 to match and my own $250, I’ve pledged $500 to make this film happen. My own Revolutionary War ancestors didn’t live long enough to be photographed, but through this film I can certainly learn about those they served with — and those they fought for. But Kickstarter has a kick: pledge goals have to be met within a specific time frame. If they’re not, then nothing happens. The money never gets collected. And this film won’t get underway. 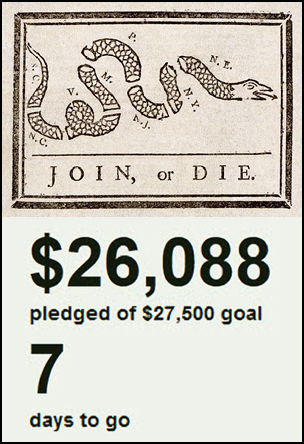 And, as of 8:30 this morning Eastern time, Revolutionary Voices needed $1,412 to meet its fund-raising goal of $27,500 … and it has just seven days left to do it. I think Revolutionary Voices is going to make its goal — but when? How about today? Tomorrow at the latest! You don’t have to take the goodies, of course. Just knowing that we’ve helped to bring to life a critical time of American history in a way that will impact our schoolchildren and, yes, ourselves… that’s enough for me. Here’s the link to pledge: Revolutionary Voices: A Last Muster Film. Just made my pledge. Thanks for sharing this! I hope it comes to fruition. Thanks, Roberta! Sure want this project to succeed!